The Splash Hill Zone Boss looks exactly like the 1st Boss Sonic ever faced, as Sonic encounters Eggman's new Ball and Chain weapon. Eggman's attack pattern is the same as it was before, swinging the ball from side to side. The addition of the Homing Attack makes this boss much easier than previous encounters. Like most bosses programmed by Dimps, Sonic is unable to attack Eggman before the boss weapon is unveiled, which means that the classic approach of taking down the boss by hitting him before he reveals the ball and chain cannot be used. In Sonic the Hedgehog 4, the game adds a new strategy to boss fights on their last hits like Sonic's newer titles do, forcing the user to change their tactics to beat him. In this boss, Eggman retracts the Ball and Chain and then whips it out in a forward spin at Sonic, smashing the platform that it hits. The way to dodge this is to retreat to the other side while he performs this deadly move. 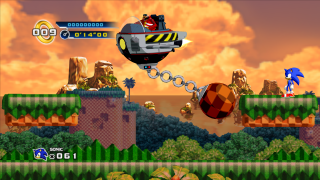 Another strategy in this mode is to quickly destroy the machine before it even whips the ball, as Eggman takes a second to prepare the attack.